In 1991, at the age of eleven, Hahn made her major orchestral debut with the Baltimore Symphony Orchestra. Soon thereafter, Hahn debuted with the Philadelphia Orchestra, Cleveland Orchestra, Pittsburgh Symphony Orchestra, and the New York Philharmonic. Hahn made her international debut in 1995 in Germany with a performance of the Beethoven Violin Concerto with Lorin Maazel and the Bavarian Radio Symphony Orchestra. The concert was broadcast in Europe. A year later, Hahn debuted at Carnegie Hall in New York as a soloist with the Philadelphia Orchestra. In a 1999 interview with Strings Magazine, Hahn cited people influential to her development as a musician and a student, including David Zinman, the conductor of the Baltimore Symphony and Hahn's mentor since she was ten, and Lorin Maazel, with whose Bavarian Radio Symphony Orchestra she performed in Europe. By sixteen, Hahn had completed the Curtis Institute's university requirements, but elected to remain for several years to pursue elective courses, until her graduation in May 1999 with a Bachelor of Music degree. During this time she coached violin with Jaime Laredo, and studied chamber music with Felix Galimir and Gary Graffman. In a December 2001 interview on PBS, Hahn stated that of all musical disciplines, she is most interested in performance. On March 17, 2015, Hahn announced via Facebook that she and her husband were expecting a child; she gave birth in August to a girl, named Zelda. Hahn began recording in 1996. She has released 16 albums on the Deutsche Grammophon and Sony labels, in addition to three DVDs, an Oscar-nominated movie soundtrack, an award-winning recording for children, and various compilations. Her recordings are often marked by a blending of newer and traditional pieces. Her albums include pairings of Beethoven with Leonard Bernstein, Schoenberg with Sibelius, Brahms with Stravinsky, and Tchaikovsky with Jennifer Higdon. Hahn has played with orchestras such as the London Symphony Orchestra, New York Philharmonic, the Royal Concertgebouw Orchestra, the NHK Symphony Orchestra, and the Singapore Symphony Orchestra. She debuted with the Chicago Symphony Orchestra in March 2007, and played in Vatican City as part of the celebrations for Pope Benedict XVI together with the Stuttgart Radio Symphony Orchestra and conductor Gustavo Dudamel, also in 2007. The concert was recorded and released by Deutsche Grammophon. In addition to being a solo violinist, Hahn has also performed as a chamber musician. Since the summer of 1992 she has performed nearly every year with the Skaneateles Chamber Music Festival in Skaneateles, New York. Between 1995 and 2000 she performed and studied chamber music at the Marlboro Music Festival in Vermont, and in 1996 she served as an artist and a member of the chamber music mentoring program of The Chamber Music Society of Lincoln Center. In 2004, she toured Saint Petersburg, Russia, with the Poulenc Trio. On January 14, 2010, Hahn appeared on The Tonight Show with Conan O'Brien for an interview, after a performance with Valentina Lisitsa on piano, in support of her album, Bach: Violin & Voice. Hahn has been interested in cross-genre collaboration and pushing musical boundaries. She began performing and touring in a crossover duo with singer-songwriter Josh Ritter in 2007 and with singer-songwriter Tom Brosseau in 2005. She has recorded songs with "…And You Will Know Us By the Trail of Dead". In 2012, Hahn released an album with German pianist and composer Hauschka entitled Silfra. The songs on the disc were completely improvised. Silfra was produced by Valgeir Sigurðsson. According to Hahn, "Other musicians cross genres all the time. For me it's not crossover—I just enter their world. It frees you up to think in a different way from what you've been trained to do." Hahn sometimes feels that classical-music admirers "make it hard for people who are just coming in. I think that if people show up in jeans and chains, it's great that all parts of culture are interested in music. People forget sometimes that it's about the music, not how you act and dress." During concerts she does hope for absolute quiet from the audience during the music. "Not out of snobbishness or holy respect for the music, but just so everyone (including the performers) can hear it. Great music can be quite comfortable and relaxing, and you can sleep—as long as you don't snore." In June 2014 Hahn was awarded the Glashütte Original MusikFestspiel-Preis of the Dresden Music Festival. Hahn is also a noted champion of new works. In 1999, she commissioned Edgar Meyer to write a concerto. She later recorded the piece with the St. Paul Chamber Orchestra. In 2010, a concerto written for Hahn by Jennifer Higdon and recorded with the Royal Liverpool Philharmonic was awarded the Pulitzer Prize in Music. Hahn commissioned 26 contemporary composers to write short encore pieces for her most recent project, In 27 Pieces: the Hilary Hahn Encores. Among the composers are David Del Tredici, Jennifer Higdon, Elliott Sharp, David Lang, Nico Muhly, James Newton Howard, and Valentyn Sylvestrov. For the 27th encore, she held an open contest that drew more than 400 entries and was won by Jeff Myers. The international premiere tours, from 2011 to 2013, were met with wide critical and audience acclaim. In November 2013, these 27 short pieces were released on Deutsche Grammophon. The recording won the Grammy Award for Best Chamber Music/Small Ensemble Performance. In 2016 and 2017, in recital tours across the U.S., Europe, and Japan, Hahn is premiering six new partitas for solo violin by Antón García Abril, her first commissioning project for solo violin, as well as her first commission of a set of works from a single composer. The relationship with García Abril was forged during In 27 Pieces: the Hilary Hahn Encores. Digital and physical editions of the complete sheet music will be released by Musicnotes and Boosey & Hawkes in Fall 2016. Complete with Hahn's fingerings, bowings, and performance notes, it will ensure that the pieces become part of the repertoire. Hahn began her film recording career as the soloist for James Newton Howard's score for M. Night Shyamalan's The Village in 2004. The film was nominated for an Academy Award for Best Original Score. Hahn's recording of Samuel Barber's Violin Concerto was used extensively in The Deep Blue Sea, starring Rachel Weisz. The film uses the piece's second movement to accompany a nine-minute sequence. In 2013 Hahn was the soloist on Andrew Hewitt's score for the film The Sea. In 1999, Hahn said that she played Bach more than any other composer and that she had played solo Bach pieces every day since she was eight. Bach is, for me, the touchstone that keeps my playing honest. Keeping the intonation pure in double stops, bringing out the various voices where the phrasing requires it, crossing the strings so that there are not inadvertent accents, presenting the structure in such a way that it's clear to the listener without being pedantic – one can't fake things in Bach, and if one gets all of them to work, the music sings in the most wonderful way. In a segment on NPR entitled "Musicians in Their Own Words", Hahn speaks about the surreal experience of playing the Bach Chaconne (from the Partita for Violin No. 2) alone on the concert stage. In the same segment, she discusses her experiences emulating a lark while playing The Lark Ascending by Ralph Vaughan Williams. Her violin is an 1864 copy of Paganini's Cannone made by Vuillaume. In an interview on Danish television, she states that she almost never leaves her instrument out of sight. Hahn uses bows by American bow maker Isaac Salchow and French bow makers Émile Ouchard, Paul Jombar, and Emil Miquel. As for her strings, she uses Thomastik-Infeld Dominants for the A (aluminum wound), D and G (silver wound) and uses a Pirastro Gold Label Steel E.
Hahn's official website includes a section entitled "By Hilary". In the Strings Magazine interview, Hahn said that the idea for her "Postcards from the Road" feature originated during an outreach visit to a third-grade class in upstate New York. The class was doing a geography project in which the students asked everyone they knew who was traveling to send postcards from the cities that they were visiting, in order to learn more about the world. Hahn decided to participate after receiving a positive reaction from her suggestion that she take part as well. Hahn enjoyed her first year's experience with the project so much that she decided to continue it on her new website. A few years later, she expanded the postcards to a journal format. Journal entries usually include photographs from her tours and rehearsals. Debuted at #1 on Classical Billboard chart for three weeks (the first Schoenberg recording to debut at #1). Ranked #6 by Newsweek on its list of the ten best albums of the decade. 1 2 "Great Performances – Hilary Hahn". PBS.org. PBS. Archived from the original on 12 October 2013. Retrieved October 2, 2013. ↑ Smith, Linell (December 15, 1991). "What nature gave, a 12-year-old hones with discipline". The Baltimore Sun. Archived from the original on 7 October 2013. Retrieved October 2, 2013. 1 2 3 4 5 Zaustinsky, Julia (August–September 1999). "A Conversation with Hilary Hahn". All Things Strings. Archived from the original on October 12, 2013. Retrieved October 2, 2013. ↑ Smith, Linell (October 9, 1994). "Hilary Hahn to play at Lincoln Center". The Baltimore Sun. Archived from the original on 12 October 2013. Retrieved October 2, 2013. 1 2 3 Cary, Emily (April 30, 2013). "Visionary violinist Hilary Hahn and the Philadelphia Orchestra together again". The Washington Examiner. Retrieved October 2, 2013. ↑ "FLASHBACK FRIDAY Hilary Hahn, 15 – Beethoven Violin Concerto, Lorin Maazel, 1995". theviolinchannel.org. The Violin Channel. Archived from the original on 12 October 2013. Retrieved October 2, 2013. ↑ Ross, Adrian (15 November 2005). "A moment with Hilary Hahn". The Daily Princetonian. Archived from the original on 2 April 2012. Retrieved 29 May 2010. ↑ Davidson, Justin (November 28, 1997). "Past Her Prime at 17? : Younger violinists are fast on the heels of Hilary Hahn. But she doesn't feel the heat". The Los Angeles Times. Archived from the original on 12 October 2013. Retrieved October 2, 2013. ↑ Great Performances (December 2001). "The Art of Violin: Hilary Hahn". PBS. Archived from the original on 26 July 2008. Retrieved 13 May 2008. ↑ "Violinist Hilary Hahn Announces Birth of Daughter,Zelda". 7 September 2015. Archived from the original on 20 October 2016. Retrieved 20 October 2016. ↑ Beaucage, Réjean (5 November 2003). "Hilary Hahn – The Lady Ascending". La Scena Musicale. 9 (3). Archived from the original on 22 November 2008. Retrieved 13 May 2008. ↑ Huizenga, Tom (September 12, 2010). "First Listen: Hilary Hahn Violin Concertos, Old And New". NPR. Archived from the original on 12 October 2013. Retrieved October 2, 2013. ↑ Bialostozky, Evan (April 2, 1999). "Hilary Hahn's Beethoven/Bernstein". Yale Herald. Archived from the original on 12 October 2013. Retrieved October 2, 2013. ↑ Clements, Andrew (March 6, 2008). "Schoenberg & Sibelius: Violin Concertos, Hahn/ Swedish Radio Symphony Orch/ Salonen". The Guardian. Archived from the original on 13 October 2013. Retrieved October 2, 2013. ↑ von Rhein, John (December 2, 2011). "Brahms and Stravinsky Violin Concertos Hilary Hahn...". The Chicago Tribune. Archived from the original on 12 October 2013. Retrieved October 2, 2013. ↑ Woolfe, Zachary (September 20, 2010). "Brahms and Stravinsky Violin Concertos Hilary Hahn...". Capital. Archived from the original on 12 October 2013. Retrieved October 2, 2013. ↑ Stearns, David Patrick (October 2, 2004). "Hilary Hahn's best disc to date. She gives an excellent performance of Elgar, an Englishman who doesn't always travel well.". The Philadelphia Inquirer. Archived from the original on 12 October 2013. Retrieved October 2, 2013. ↑ von Rhein, John (March 31, 2007). "Youthful Hilary Hahn delivers beauty, artistry and maturity". The Chicago Tribune. Archived from the original on 12 October 2013. Retrieved October 2, 2013. ↑ "Hilary Hahn". The San Francisco Classical Review. Archived from the original on 12 October 2013. Retrieved October 2, 2013. ↑ "Birthday Concert for Pope Benedict XVI". Deutsche Grammophon. Archived from the original on 12 October 2013. Retrieved October 2, 2013. ↑ Johnson, Melinda (August 5, 2010). "Violinist Hilary Hahn Finds Skaneateles 'Very Peaceful'". The Syracuse Post-Standard. Archived from the original on 12 October 2013. Retrieved October 2, 2013. ↑ Wise, Brian (July 23, 2011). "At Marlboro, They Come to the Vermont Woods to Play, Not To Perform". WQXR. Retrieved October 2, 2013. ↑ "The Tonight Show with Conan O'Brien: Rob Lowe, Jane Krakowski, Hilary Hahn". TV.com. Archived from the original on 4 June 2011. Retrieved 13 February 2010. ↑ Rose, Joel (4 March 2007). "Concert Violinist Plays Indie-Rock Gigs". Weekend Edition Sunday. NPR. Retrieved 13 May 2008. ↑ Reich, Ronni (February 17, 2013). "Respecting fans' good taste: Violinist Hilary Hahn deftly blends the familiar with the obscure". The Newark Star-Ledger. Retrieved October 2, 2013. ↑ Smith, Steve (July 6, 2012). "'Silfra,' by Hilary Hahn and Hauschka". The New York Times. Retrieved October 2, 2013. ↑ Huizenga, Tom (May 13, 2012). "First Listen: Hilary Hahn And Hauschka, 'Silfra'". NPR. Retrieved October 2, 2013. 1 2 3 Bargreen, Melinda (15 January 2007). "Hilary Hahn at ease in classical, "jeans and chains" worlds". The Seattle Times. Retrieved 29 May 2010. ↑ "US-Geigerin Hilary Hahn erhält Preis der Dresdner Musikfestspiele". Neue Musikzeitung (in German). Retrieved 21 November 2015. ↑ Huebner, Michael (September 25, 2011). "Violinist Hilary Hahn to reprise Edgar Meyer concerto with Alabama Symphony". AL.com. Retrieved October 2, 2013. ↑ Schweitzer, Vivien (April 21, 2010). "Despite Anxiety and Naysayers, Composer Wins Her Pulitzer". The New York Times. Retrieved October 2, 2013. ↑ Mermelstein, David (October 26, 2011). "The Commissioner of Short Works". The Wall Street Journal. Retrieved October 2, 2013. ↑ Robin, William (February 12, 2012). "New Kind of Online Dating: Classical Competitions". The New York Times. Retrieved October 2, 2013. ↑ Swed, Mark (May 8, 2013). "Review: Hilary Hahn's 27 Pieces strikingly eclectic at Disney Hall". The Los Angeles Times. Retrieved February 12, 2012. ↑ Woolfe, Zachary (February 25, 2013). "For Encores, an Artist Invites Social Media Onstage". The New York Times. Retrieved October 2, 2013. ↑ Downey, Charles (February 17, 2013). "Violinist Hilary Hahn's new encores served as musical dessert at Kennedy Center". The Washington Post. Retrieved October 2, 2013. ↑ Clemency Burton-Hill (5 November 2013). "Hilary Hahn's project In 27 Pieces: Reviving the encore". BBC Culture. Retrieved 12 January 2015. ↑ Cunningham, Greta (February 11, 2005). "Hilary Hahn transitions from young phenom to established soloist". Minnesota Public Radio. Retrieved October 11, 2013. ↑ Turan, Kenneth (March 23, 2012). "Movie review: Rachel Weisz a passionate force in 'Deep Blue Sea'". The Los Angeles Times. Retrieved October 11, 2013. ↑ Lodge, Guy (July 2, 2013). "Edinburgh Film Review: 'The Sea'". Variety. Retrieved October 11, 2013. ↑ Saint Paul Sunday (1 April 2001). "Bach's Six Sonatas and Partitas for Solo Violin". American Public Media. Retrieved 13 May 2008. An excerpt from the liner notes to Hahn's album Hilary Hahn Plays Bach. ↑ David Schulman; Jeffrey Freymann-Weyr (13 October 2004). "Musicians in Their Own Words: Hilary Hahn". NPR. Retrieved 13 May 2008. ↑ "Hilary Hahn,Violin". the Strad. Archived from the original on 2016-04-22. ↑ "Famous Violinists and Their String Brands". violin-strings.com. Retrieved 21 November 2015. ↑ O'Niel, L. Peat (26 August 1999). "Guest Violinist, 19, Sets Virtuoso Tone In Loudoun Symphony Performance". The Washington Post. Retrieved 29 May 2010. ↑ Quinn, Emily (13 October 2005). "Albums by Trio Mediæval, Hilary Hahn, Natalie Zhu enter Billboard Classical Chart". Playbill Arts. Archived from the original on 27 September 2011. ↑ "Bach: Violin & Voice". Amazon.com. Retrieved 13 February 2010. 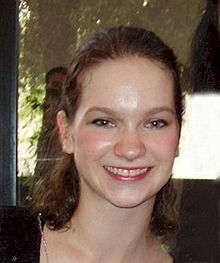 Wikimedia Commons has media related to Hilary Hahn.